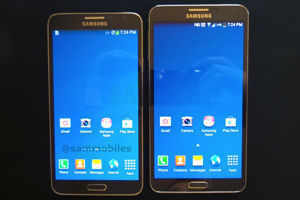 SamMobile has spilled the beans on the features of the upcoming model, touted as the smaller version of the Galaxy Note 3 phablet. NEW DELHI: Though samsung unveiled its new line of professional-grade tablets at the Consumer Electronics Show this year, it did not showcase any smartphones. However, the launch of the rumoured Galaxy Note 3 Lite seems imminent, with several photos and specifications of the model leaking online. Technology website SamMobile has spilled the beans on the features of the upcoming model, touted as the smaller version of the Galaxy Note 3 phablet. The images show that the handset will bear the same look as Samsung's current top-end phablet and will have similar faux-leather back panel. However, the design of the camera module is a little different. Other key features of the model include 2GB RAM, 8MP rear camera, 2.1MP front camera, LED flash, 16GB internal storage, microSD support and 3,100mAh battery. The phone will run on Android 4.3 (Jelly Bean) upon launch, though the final software build may differ. Galaxy Note 3 Lite will also come with the S Pen stylus and have all the related stylus features, such as Screen Write, Scrapbook, Pen Window etc. Connectivity options of the phone Lite include Bluetooth 4.0, microUSB, NFC, Wi-Fi and infrared. In Antutu benchmark test, Samsung Galaxy Note 3 Lite scores higher than Galaxy S4, but lower than the Note 3. It is expected that Samsung will unveil the Galaxy Note 3 Lite at the Mobile World Congress in February.